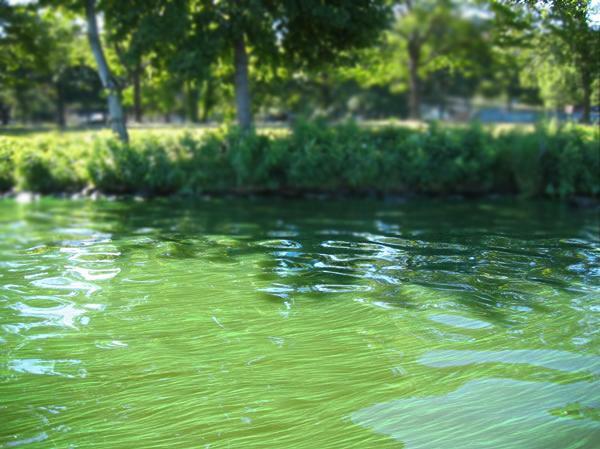 With the unusually warm temperatures, blue-green algae has appeared in some lakes. The problem will increase as waters warm. Blooms can look like pea soup, green paint, or floating mats of scum and sometimes have a bad smell. Blooms aren’t always large and dense; sometimes they only cover small portions of the lake or are suspended in the water and don’t form a surface scum. Unfortunately, some of these blooms can produce toxins that are harmful to people and pets. People can become sick after they recreate in water that has toxic blue-green algae by swallowing or having skin contact with water or by breathing in tiny droplets of water in the air. In most people, symptoms are mild and may include vomiting, diarrhea, rash, eye irritation, cough, sore throat, and headache. Dogs are at particular risk, because they tend to swallow more water than humans while swimming and lick their coats after swimming, swallowing the algae on their fur. Dogs exposed to toxic blue-green algae can experience symptoms such as vomiting, diarrhea, rash, difficulty breathing, general weakness, liver failure, and seizures. If your dog has symptoms after visiting a lake, seek veterinary care immediately. In the worst cases, blue-green algae exposure can cause death. There is no way to tell if a bloom is toxic just by looking at it. People and pets should avoid water that has a blue-green algal bloom and any algal debris that may wash up on shore. If you or your pet have contact with blue-green algae, wash off with fresh water as soon as possible. There are currently no short-term solutions to fix a blue-green algal bloom. With high temperatures, blue-green algal blooms will be common on many Minnesota lakes this summer. A change in weather – rain, clouds, or wind – will break up a bloom. Reducing the amount of nutrients in lakes would improve overall water quality and reduce harmful algae blooms. Runoff from urban and agricultural land contains phosphorus. Landowners and farmers should limit the application of phosphorus-containing fertilizers. Maintaining a buffer around lakes and rivers can help reduce the amount of nutrients that reach the lake. Homeowners can help by sweeping up lawn clippings, leaves, and soil off sidewalks and pavement, and cleaning up pet waste, so that rain storms don’t wash the material into nearby lakes and rivers. 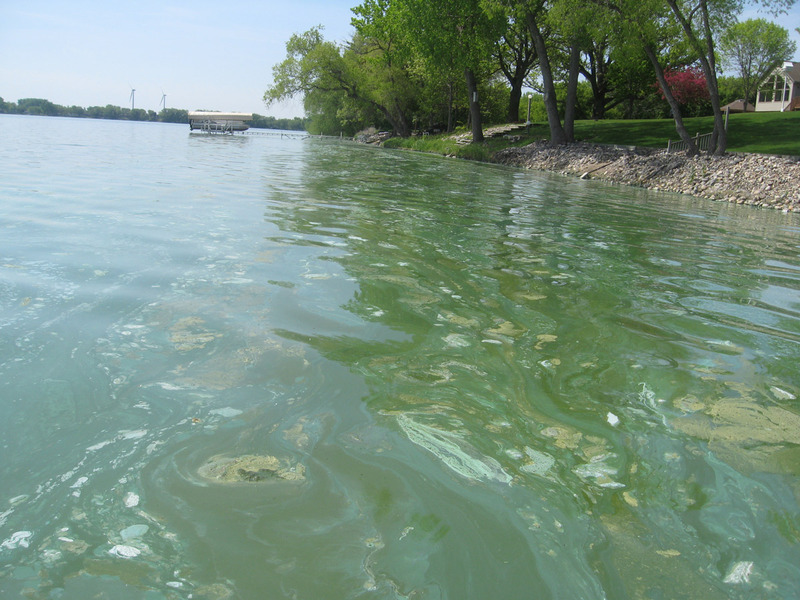 More information on blue-green algae, how to determine if you have blue-green algae, and how to report a possible human or animal illness, is available on the MPCA Harmful Algal Blooms website.